Sometimes a Disney story isn’t really about Disney. This is one of those stories. My wife and I go to Disney parks more than most. Obviously we don’t go nearly as often as our love of the parks would suggest, especially compared to other fans with a similar level of devotion, but we go far more than the average married couple in their 30’s who don’t live near the parks. So inevitably when I announce that we’re taking another trip to Disneyland or Walt Disney World I’m always met with the question of “Why?” People are frequently confused as to why we’d choose to fly or drive across the country to visit a crowded, hot, expensive tourist destination we’ve visited many times before. I’ve grown increasingly tired of this question, mostly because people use it to launch into a diatribe against everything Disney, but also because I’ve never felt like I have an answer that satisfactorily explains the depth of feeling I have towards the Disney parks. The cliché of “they make me feel like a kid again” doesn’t hold true for me at all, because the parks and Disney in general mean far more to me as an adult than it ever did as a child (despite loving it all my life). I try to talk up the concept of Disney’s idealism and optimism, but people tend to just dismiss that sort of thing. I try to tell them all of the reasons I want to work for Disney. I point out that the Disney parks offer an experience that is completely unlike anything anywhere else on the planet, the quality of the theming, the high caliber of Disney’s cast members, the level of care that goes into every detail, but most people are only interested in how fast the roller coasters are or whether they serve beer. But after this most recent trip to Disneyland a few weeks ago, I finally find myself with a story that does justice to my lifelong devotion to Disney. As many readers may know, our son Luke was stillborn back in March. What you may not know is that we went to Disneyland last September with my parents, and the trip doubled as an opportunity to take pregnancy announcement pictures in front of Sleeping Beauty Castle. We got a “First Visit” button for my wife to pin on her belly, and Mickey ears for the whole family to wear, including little ones for my wife to hold over Luke for the pictures. 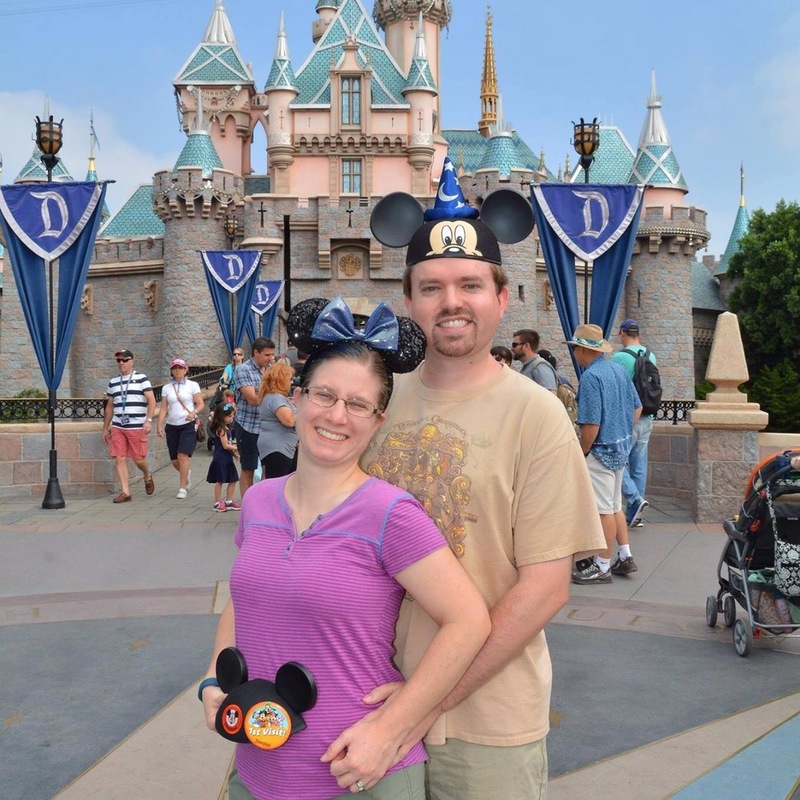 The whole trip was a joy, even if visiting Disneyland while pregnant meant that my wife was uncomfortable, had to pee a lot, and couldn’t ride a lot of rides. It was filled with possibility and anticipation, knowing that this was just the first of many trips for Luke, and I spent it envisioning taking Luke for his first “real” trip in a few years and watching his reactions to all of the Disney magic. Unfortunately, things don’t always work out the way you dreamed and hoped and prayed and envisioned. Soon after that trip we discovered that Luke had a cleft lip and palate which would require special feeding accommodations and a series of corrective surgeries we began to prepare for, some heart abnormalities that might also require surgery and meant we had to plan our delivery at a different hospital, and a genetic microdeletion that is largely unstudied but which has been tied to a wide variety of learning difficulties and behavioral issues. So the next 6 months were filled with additional stress and worry and extra planning alongside the usual joy, fun, and panic that comes with expecting your first child. And in the end we lost him anyway, and like many whose children are stillborn we’ll never have a clear answer as to why. But this is not the story of losing our son. I’ve already written that story. In the months after Luke’s death we started planning a grand, two week road trip through California. It had long been on our list of vacations we wanted to do but we’d just never gotten around to it, and when my wife got pregnant with Luke we figured it would get postponed for quite a while. From Tucson to LA to San Francisco back to LA to San Diego and back to Tucson. An added bonus would be a chance to celebrate our 10th anniversary, which was over the summer, and my wife’s birthday. But the question of Disneyland loomed over the trip. There was no way we’d spend all that time in California and pass through LA twice without hitting Disney, but the thought of returning to a place that was so important in the short time we had with Luke was entwined with complex emotions. Still, we knew we would be returning to Disneyland eventually, and there was something to be said for crossing that bridge sooner rather than later. The trip itself turned out to be exactly what we needed. It broke us out of the routine we’d settled into in the months after Luke’s death, giving us new perspective and a breath of fresh air in addition to simply allowing us to have a fantastic time and see amazing things without the responsibilities at home while spending time with just the two of us. (A huge thank you to my parents, one of my best friends, and a pet sitter who watched our home and our bunnies for us while we were away.) We have a bear we call “Luke’s Bear” that we took with us. The bear is the same length that Luke was when he was born, and we got an identical outfit to the one in which we had planned to bring Luke home from the hospital for the bear to wear. 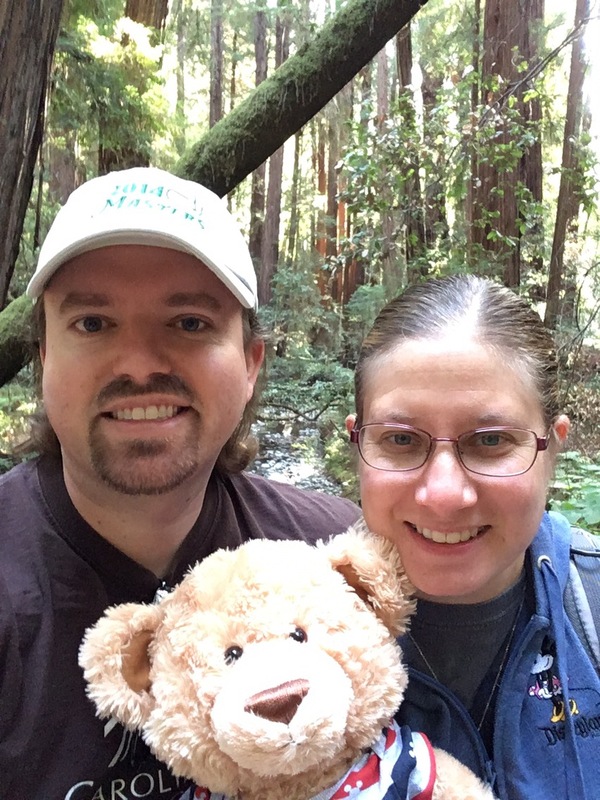 We took Luke’s Bear with us on some of our outings, including hiking through Muir Woods, not as a replacement or surrogate for Luke, but as a reminder and a comfort. But eventually the day came when it was time to go to Disneyland. 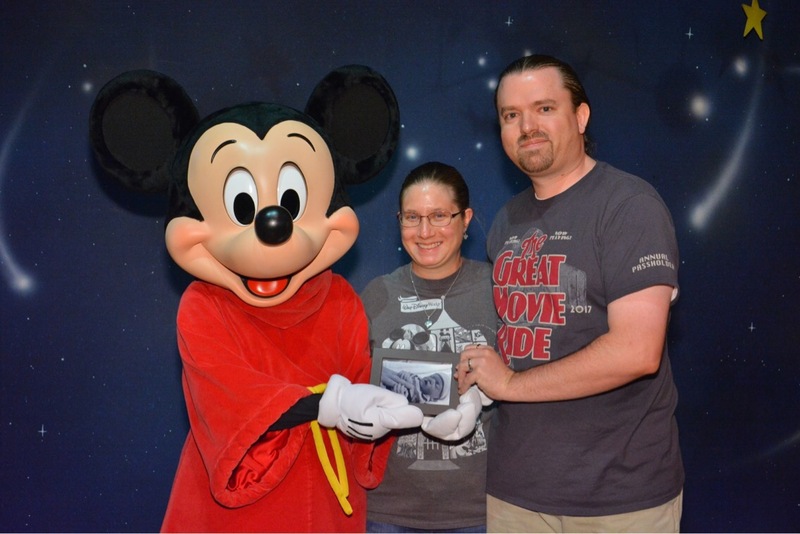 My wife had come up with a wonderful idea as we planned our trip, for us to take a picture of Luke with us to Disneyland and get a “family picture” with Mickey Mouse. But in the months leading up to the trip I started to worry about every aspect of this plan, even while being fully onboard with it. Despite many trips to the parks, my wife and I have never gotten our picture taken with a character, and I hadn’t personally done it since I was a little kid decades ago. (Goofy made me cry, and we couldn’t figure out who Smee was.) I didn’t know the protocol, what to expect, or how things worked, and anyone who has lost a child knows the need we feel to be fully prepared for every upcoming event and to know of any triggers beforehand. 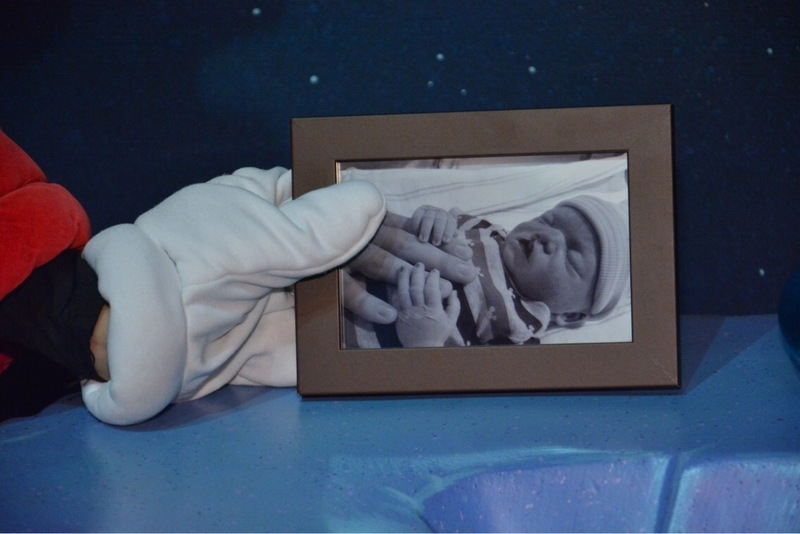 I started researching an aspect of the Disney parks experience that was foreign to me, and I even emailed and tweeted at Disneyland customer service to ask whether there were rules against Mickey Mouse holding our dead son’s picture. 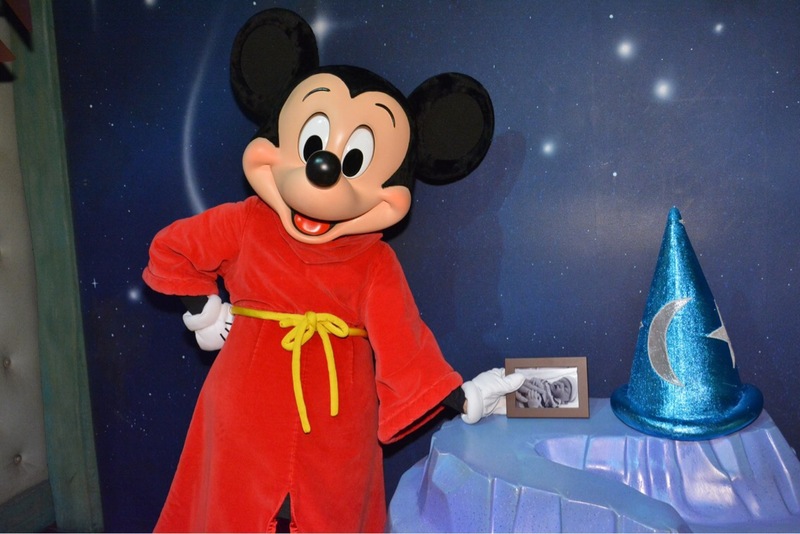 I was told that it’s against policy for Mickey to hold any personal objects people bring (which makes sense… you don’t want Mickey dropping your prized possessions thanks to those big, white gloves), but that we were welcome to show him anything we wanted to bring. So I’d mercifully headed off one potential disappointment, but whenever you deal with anything involving your deceased child there’s always the potential for someone to say or do something that can ruin an entire moment/day/week/month. Getting ready to go to Disneyland that morning was different than any other Disney morning I’ve experienced. There was a shadow of uncertainty hovering over it, not knowing what to expect or how we’d react to my wife’s plan. We got to the park and immediately made our way to the back of the park, where Mickey’s house and meet & greet sits in Toontown. To meet Mickey you first have to wander through his house (which doubles as a queue when lines are especially long), until arrive at the final waiting area. There were only a handful of families in line, thankfully, and we only had to wait for a few minutes before we were ushered in at the back of a set of four families. Mickey cheerfully greeted the group (with a handler and Photopass photographer alongside, of course), and we watched as parents, children, and grandparents hugged Mickey, got their picture taken, and exited out the other side of the room, leaving us for last. Mickey immediately spotted my wife’s “Happy Birthday” button, and threw his arms up in celebration, while I retrieved Luke’s picture from my bag. I held it up for him to see and explained that “this is our son, Luke, who we lost six months ago, and we brought his picture with us so we could get a family picture with Mickey,” bracing myself for any of the million horrible outcomes I’d imagined for several months. But I was not emotionally prepared for what happened next. Mickey immediately reached out for Luke’s picture, and pulled it into a tight hug. He then held our son’s picture up and looked at him, before kissing it over and over. He then held the picture up and motioned for us to join him as we took the family picture we had wanted. To my surprise, Mickey took Luke’s picture back from us a second time, gesturing to the photographer that he had an idea. He then held Luke’s picture next to his sorcerer’s hat from Fantasia, which sat on a table behind us, as the photographer continued to snap away. He then hugged and kissed Luke’s picture again before handing it gently back to me and then pulling first my wife and then me into long, comforting hugs. We thanked Mickey and his assistants, carefully wrapped up Luke’s picture and returned it to my bag, and headed back out into the Happiest Place on Earth. Mickey Mouse saw our son. I don’t mean that the mere fact of Mickey seeing Luke’s picture changed things for me, it’s so much more than that. Mickey Mouse saw our son. He didn’t see a dead body, or a memorial picture, or a tragic story, or an uncomfortable topic of conversation, or an unfortunate lesson, or an awkward cloud, or any of the other things, symbols, or circumstances that Luke usually represents to people. Mickey Mouse saw our son. He saw a child to be hugged and kissed, to be loved and honored and remembered of course, but a child worthy of being treated like any other child. Mickey gave Luke’s picture the same pure love and affection and attention he gave to the little boy and girl who had been in line in front of us, while still honoring and memorializing Luke in his own special way. It was something I didn’t realize had been missing, even and especially from my own perspective. It’s so easy when you lose your child to reduce him or her to something small. He’s a picture, or a memory, or plaque on a wall, or a box on the mantle, or a grave, or a dream, or an angel, or a tattoo, or a piece of jewelry, or a stuffed bear. Since leaving the hospital, I had struggled to look at Luke’s picture. It brought up too many flashbacks, conjured up the worst emotions in me, and was generally not how I wanted to remember my son. I focused on other images and moments and feelings instead, compartmentalizing our son and reducing him to only the parts I wanted to see. But in five minutes a cast member in a Mickey Mouse costume changed my perspective, by seeing Luke not as a small piece of what he was but as a child just as worthy of inclusion as any other. In that moment, though, it wasn’t just a person in a costume. It was Mickey Mouse, the icon, the legacy and creation of Walt Disney, treating Luke with respect and sadness but with the same love and joy he has shown countless children and adults for the last 89 years. In truly seeing Luke, Mickey has allowed me to truly see Luke, without treating him as less than he is or reducing him to whatever aspect of his existence is convenient for me at the moment. I can finally look at Luke’s pictures thanks to Mickey Mouse, and that one encounter among probably thousands Mickey had that day completely changed the flow of my grief and the path of my healing. The rest of that day and our next at Disneyland were emotional but ultimately joyous and wonderful, much more than they would have been had we not spent time with Mickey. The rest of our trip was equally excellent, and we returned home refreshed and rejuvenated, if perhaps slightly poorer and tired. The entire trip was exactly what we needed. In many ways it was a reset button for our lives, not so we could forget or dismiss Luke or what has happened to us over the last year, but as a way to break out of the cycle of the last few months in order to “keep moving forward” once again. I find my days and my nights easier since returning, and my attitude and emotions are in a far better place than they were. It was a trip filled with amazing sights and experiences which are burned in my memory, but I keep coming back to Mickey Mouse. It may be unimportant when compared to the actual experience I described above, but I now have an answer to the “why Disney?” question that so often plagues us when we plan a Disney parks trip. Mickey Mouse saw my son, truly saw him, and in doing so helped me to learn to see him as well. It’s the sort of moment that goes beyond words or description, and one that I’ve come to expect from Disney but have never encountered anywhere else. And while every parent who has lost a child must find their own way through the darkness, though they don’t have to do it alone, for me, Mickey Mouse has been one of the defining moments in the life and death of our son Luke. Thanks to that one special day (and the employees, cast members, and guest services people who played a role), I find myself carrying Luke with me with a sense of hope once more. October is National Pregnancy and Infant Loss Awareness Month, and October 15th is Pregnancy and Infant Loss Remembrance Day. This entry was posted in In Memoriam, Theme Parks and tagged child loss, Disney, disney parks, Disneyland, grief, loss, Luke, mickey mouse, pregnancy loss, stillbirth, stillborn by lovepirate77. Bookmark the permalink. Oh Josh and Ginny, what a wonderful testament to the strength of your marriage and the ability to let this trip and this simple little mouse help to fill that place in your heart that was left open after losing little Luke. It was meant to be that the Mickey character you encounted that day was able to look into your hearts and know just what to do to ease your pain and put you on the road to healing. I was so moved to read your story and to know you are in a better place in your life from this experience. Love you and Ginny and pray for your continued health and healing! This says something about the caliber of storytellers working at Disney…they are not just folks in cartoon costumes, they are storytellers, with all the insight and empathy great stories and storytellers have. This is why I grew up loving Disney, and why after 62 years, I still do. Neither the stories, nor the parks, are superficial fluff… they have depth. I have not been to a park, but it seems the idea is to bring you into that world, to immerse you in it… far more than just “here’s another photo op”. You are part of the story and it changes you. I half remember reading about dancers in either Navajo or Hopi ceremonies… the dancer does not put on a costume, the dancer becomes the god they are representing. No Disney character is a mere costume. Mickey saw your son. Mickey and all he represents of innocence and joy and kindness and the best parts of ourselves. Every time I hear someone say Disney and other cartoons are “just for kids” I am annoyed. This kind of storytelling is universal, and as your experience shows, it goes beyond entertainment to something deep and necessary in our lives. It is needed; the stories, the characters, and the parks bringing it to life. Sometimes people need stories more than food. I think the bear is fabulous. Carry on. You are a lovely couple, and you’ll be fine parents one day. No matter what anyone says, there is still a lot of good in Disney as shown here 🙂 !